If you were hoping for some surprises during Huawei's upcoming October 16 event – avert your eyes now, as the as-yet unannounced Mate 20 has appeared online in all its glory ahead of the official reveal. The latest leaked images reveal a number of key details about the handset, including the minimal, teardrop-like design of the notch. It also confirms the long-rumoured under-screen fingerprint reader will be reserved for the Mate 20 Pro model only. The biggest differentiator between the Huawei Mate 20 and the pricier Mate 20 Pro is the design of the notch at the top of the display, leaked promotional shots reveal. 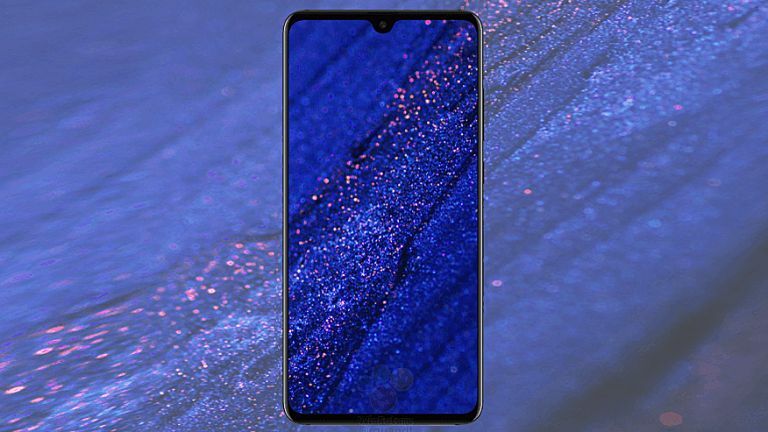 While the Mate 20 Pro is expected to boast an elongated cut-out along the top of the display to house a facial recognition system similar to FaceID on the iPhone X, the Mate 20 will favour a small teardrop-style notch reminiscent of the Essential Phone. Instead of fancy 3D face scanning technology, the Mate 20 will rely on a good ol' fashioned fingerprint reader found on the rear of the handset, beneath the camera. This is another differentiator between the Mate 20 and the Mate 20 Pro, since the latter is also rumoured to become the first mainstream smartphone to include a fingerprint reader embedded beneath the glass display (presumably for those apps that don't support authentication with your punum). OnePlus has already confirmed plans to debut an in-display fingerprint scanner with its next flagship phone, OnePlus 6T, although no launch date is confirmed. According to the latest leaks, the Huawei Mate 20 will sport a 6.43-inch display with a resolution of 1,080 x 2,244 pixels. If accurate, the Mate 20 would boast a marginally bigger screen than its pricier sibling, which is tipped to have a curved 6.3-inch panel. Both smartphones will have a triple-camera set-up on the back of the phone. Presumably, this square-shaped system will have the same coupling of a telephoto lens, colour (RGB) sensor, and a monochrome sensor seen in the Huawei P20 Pro. This seemingly excessive set-up allows Huawei to bring 3x optical zoom to its smartphones, as well as brilliant low-light performance. Despite both Mate 20 and Mate 20 Pro set to ship with the same camera system, Huawei has slightly tweaked the set-up on each, presumably so everybody will be able to tell whether you splashed-out on the flagship model or not. While the Mate 20 Pro has the LED flash in the top-left corner of the square-shaped camera module, the regular Mate 20 model has it in the top-right corner. Huawei is set to hold its Mate 20 press conference on October 16, 2018 when all the details on its latest and greatest handset will be unveiled, so stay tuned.